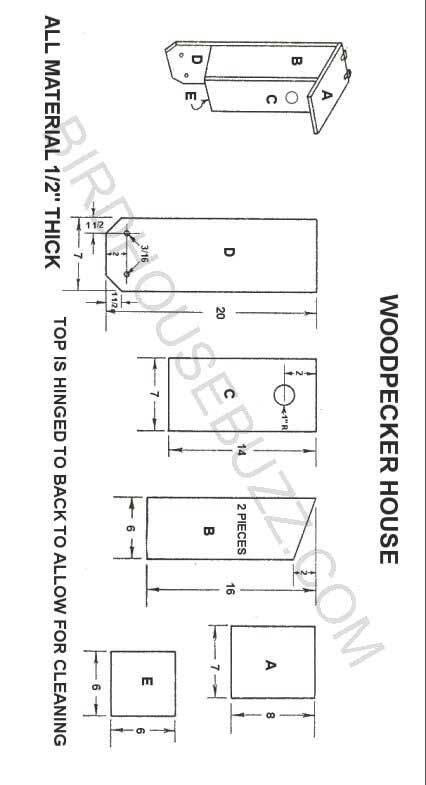 Build a woodpecker house with free plans. Since woodpeckers typically build their nests at the bottom of a tree cavity, a woodpecker house is unusually deep with the opening near the top. This construction gives the nesting pair the feeling of security they need to raise their brood. The woodpecker house may be built with scrap lumber, and the narrow but tall structure should have a removable bottom so you can clean out the nest when unoccupied at the end of the season. You may need to position your woodpecker house quite high on a tree, as some species will feel comfortable at heights of up to 20 feet. The favorite of this interesting woodpecker family is the little Downy Woodpecker. Living largely upon harmful grubs and insects, this bird does an immense amount of good by protecting our forests from insect scourges. Woodpeckers do not build nests as most birds do, but excavate a deep cavity in some dead tree leaving a quantity of chips at the bottom on which the eggs are laid. Nesting boxes should be of the rustic type, leaving some sawdust mixed with a little earth in the cavity. These houses should be placed on trees in a park or orchard. Care must be taken that all wood pieces are sawed or planed to the correct sizes with edges and ends square and true so there will be no bad cracks for drafts and rain to enter. Be careful to nail the pieces together so that they will not have occasion to crack or warp.